Responsible financial advisors across the country are apologizing to their clients for the seventh year in a row. Because the diversified portfolios they have built are lagging U.S. stocks … for the seventh year in a row. Any way you look at it (from a conservative to aggressive allocation), diversified portfolios have failed to keep pace with the juggernaut known as the S&P. The ratio of U.S. stocks to the rest of the world is at a new all-time high. 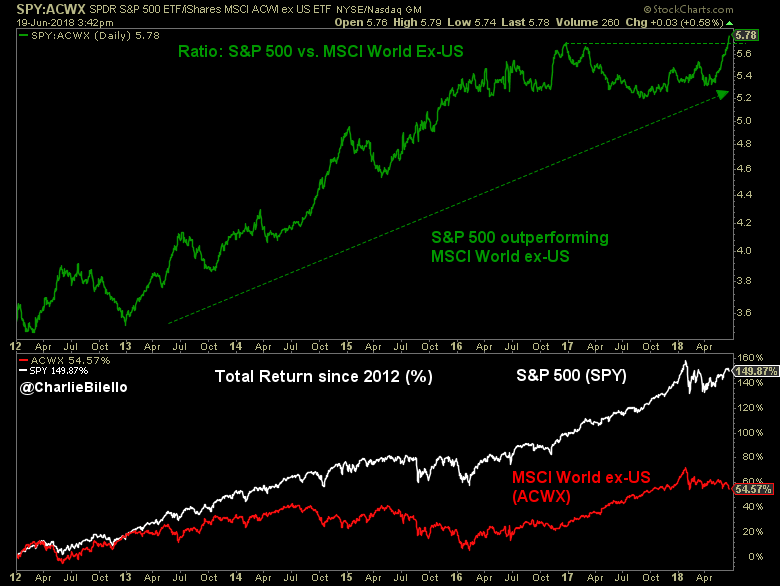 While the S&P 500 has gained 150% since 2012, the MSCI World excluding the U.S. (ACWX) is up only 55%. Compared to bonds, the gap is much wider, as the largest U.S. bond ETF (AGG) has generated a paltry 1.9% per year since 2012 versus 15.3% for the S&P 500. So why doesn’t everyone diversify? Because diversifying means there will always be an asset class beating you. 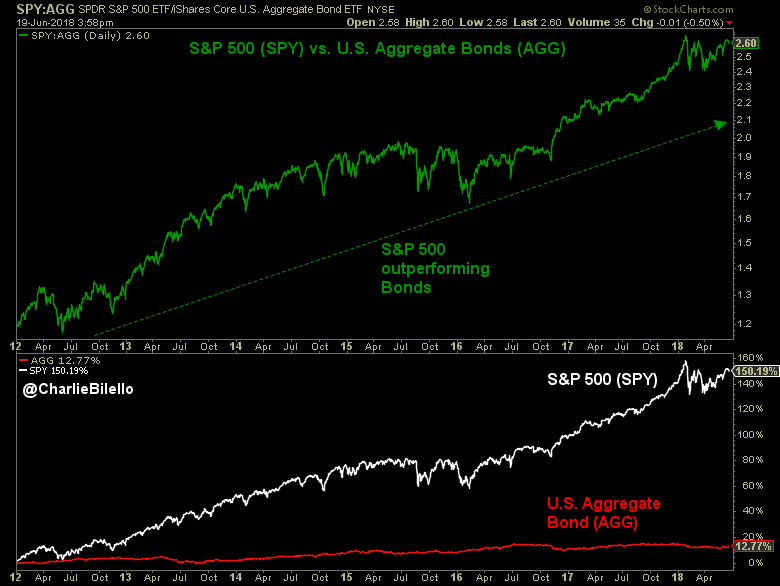 Today, that asset class is U.S. equities and the fear of missing out (FOMO) on further gains is palpable. Over the past seven years, each of the following asset classes have all massively trailed U.S. equities: International bonds, U.S. investment grade bonds, U.S. Treasuries, Asia-Pacific stocks, European stocks, and Emerging Market stocks. 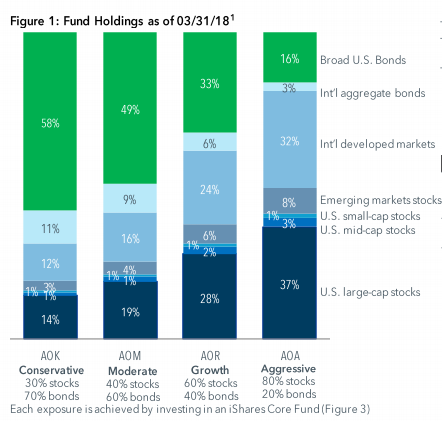 Among the iShares asset allocation ETFs, U.S. equities make up just 41% of the most aggressive portfolio (AOA) and only 16% in the most conservative portfolio (AOK). It is mathematically impossible to keep pace with an unrelenting run in U.S. stocks when you own anything other than U.S. stocks. Does that mean investors should abandon diversification and succumb to FOMO, putting 100% of their portfolio in the S&P 500? Only if they are 100% sure that the next seven years will look exactly like the past seven (unlikely, as the S&P 500 has outperformed the MSCI World ex-US Index in just over 50% of calendar years, little better than a coin flip). Only if they can handle significantly higher volatility (since 2012, the S&P 500 has an annualized volatility of 13% vs. 6% for the AOM moderate allocation ETF – and this has been among the lowest volatility periods in history for U.S. equities). Only if they can handle much higher drawdowns (the S&P 500 lost 37% in 2008 vs. 10% loss for a 40/60 allocation to US stocks/bonds). Of course, no one can be sure of what will happen over the next seven years and few can handle higher volatility/drawdowns than their risk tolerance suggests. Which is why we diversify in the first place: to protect ourselves from the unknowable future and the visceral responses we all have to volatility/drawdowns. That protection is nothing to apologize for, even if it means massively underperforming the S&P 500 over a seven-year period. To the contrary, it is to be commended. It’s far easier today to give in to your clients’ demands and take a punt on the S&P 500 than it is to defend diversification. But defend it you must if you wish to remain a professional in this business, for a large part of what you are being paid for as an advisor is protecting your clients from themselves. Anyone can go out and buy the S&P 500; the problem is that few can stick with it through the ups and downs. Regardless, S&P 500 is not your benchmark as an advisor; your benchmark is helping your clients meet their goals by taking the highest probability path. That path necessarily includes diversification and excludes betting the ranch on any one stock or asset class. 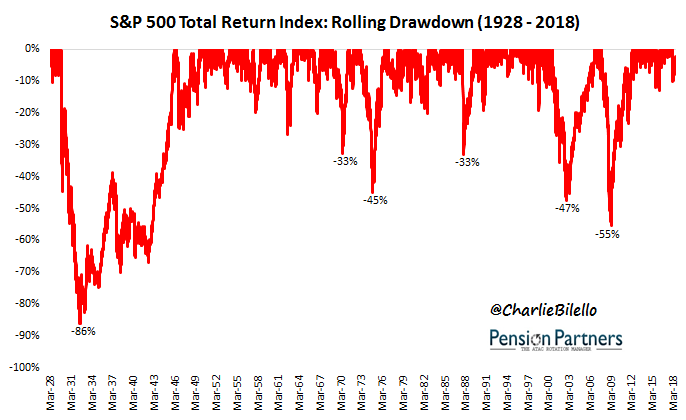 Your clients may not remember the last time the S&P 500 had a down year (2008) or care to learn about historical drawdowns, but it is your job to educate and remind them. For if you don’t it’s only a matter of time before FOMO gets the better of them.